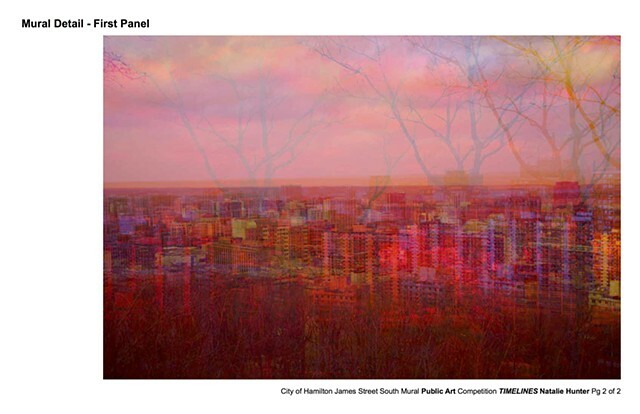 Timelines is a photo-based public installation that explores notions of memory, time, and space within Hamilton’s geographical and urban landscapes, and surrounding communities. Light, an essential ingredient in photography, and a material I use frequently in my work, is used as a metaphor for memory. The Hamilton community is known for it’s industrial roots as a steel making city, and it’s unique geographic location on Lake Ontario and the Niagara Escapement; elements of Hamilton that are often romanticized, and yet remain an integral part of Hamilton’s rich history. For me, Hamilton’s escarpment is an in-between space; part leisure, part barrier, part childhood haunt. Using Hamilton’s escarpment as a platform for collecting photographs of Hamilton’s industrial core, urban landscapes, and natural geology, I walk along the escarpment edge, traversing Hamilton from East to West looking down into the city and out to the horizon. Layering photographs within the camera as I walk, I use colour filters and in-camera multiple exposures to record my experiences of Hamilton through rose tinted glasses. The resultant aluminum panel installation becomes multifaceted and kaleidoscopic; resembling pieces of film that have been continually fed through an analogue camera. In this gesture, I attempt to capture Hamilton through time and memory. As viewers walk along the side-walk they are able to physically traverse the entirety of urban Hamilton from the West to East end and back again. They are also able to walk both above and below the horizon line. 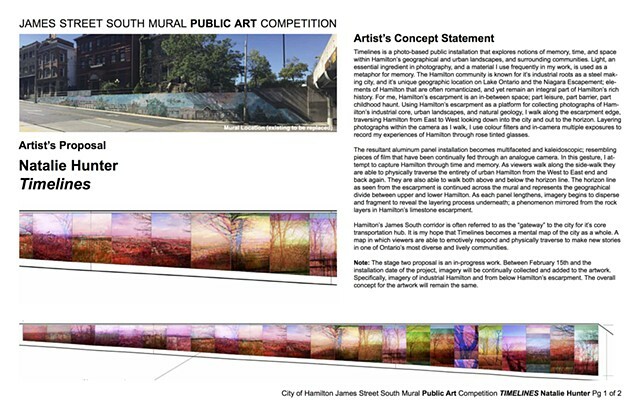 The horizon line as seen from the escarpment is continued across the mural and represents the geographical divide between upper and lower Hamilton. As each panel lengthens, imagery begins to disperse and fragment to reveal the layering process underneath; a phenomenon mirrored from the rock layers in Hamilton’s limestone escarpment. Hamilton’s James South corridor is often referred to as the “gateway” to the city for it’s core transportation hub. It is my hope that Timelines becomes a mental map of the city as a whole. A map in which viewers are able to emotively respond and physically traverse to make new stories in one of Ontario’s most diverse and lively communities. rich, having the potential to connect the escarpment to the city and therefore scored it very high on artistic merit." - Jury Report, March 28, 2018.